’Tis the season…to be undead. 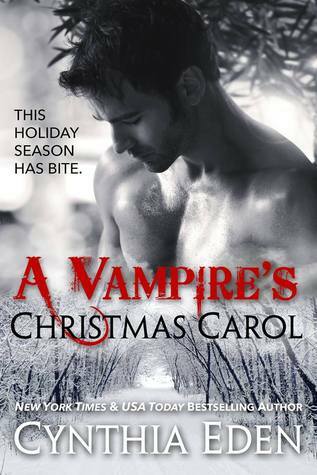 I loved how Cynthia Eden turned the Christmas Carol into a tale involving a Vampire and how he has to make changes to his life. If he does not change, he will lose himself to death or someone he loves to the darkness. Cynthia incorporates the famous tale of the Christmas Carol with of course three visitors visiting the vampire, Ben Prescott. He will be taken back to the past, to the present, and the future with the help of some people, who have come into his life. He will learn the mistakes he did and what he should do to fix them. It will take a real eye-opener for him to realize the path he is on is going to lead him to destruction. The events of the past lead to everything that will happen to Ben in the future, and he was not expecting what happened in the future to happen. Cynthia gives a great spin of the Christmas Carol with a paranormal romance twist. I was intrigued the minute I started reading the book and kept reading until I finished it to find out what would happen next. I loved how the tale involved not only vampires, but demons, angels, and shifters that played a role in the story. I give this book 5 full moons and highly recommend it to readers out there that love Cynthia Eden’s books, readers that love paranormal romance and Christmas themed books. This is the perfect quick read for the holidays.